It will likely be announced sometime Thursday. Williams will not be returning to the "NBC Nightly News" anchor chair; his fill-in Lester Holt will become the program's permanent anchor. The appointment makes Holt the first black solo anchor of a weekday network nightly newscast. So what will Williams do? His portfolio will include a position on MSNBC, NBC's struggling cable news channel. "He will be the face of MSNBC," handling big breaking news stories, one of the people said on condition of anonymity. Williams may have other responsibilities as well. Details are still scarce and subject to change. "No one knows anything," one anchor at the network complained Wednesday. It has yet to be determined when and how Williams will express regret for the storytelling exaggerations that led NBC to suspend him in February. But there have been discussions about a sit-down interview setting for Williams to show remorse and start to turn the page on the controversy, one of the sources said. Williams' attorney Bob Barnett and a spokesman for NBC News declined to comment ahead of Thursday's expected announcement. The Williams controversy erupted in February when soldiers pointed out that the anchorman had wrongly recounted an Iraq War mission in 2003. Williams had said he'd been aboard a helicopter that was forced down by a rocket-propelled grenade, when in fact he had been on a different chopper. Soon there were questions about other reporting stories Williams had told. His credibility as a journalist was on the line. NBC initiated an internal fact-checking investigation, led by its top investigative producer, Richard Esposito. In a matter of days, NBCUniversal CEO Steve Burke had decided to suspend Williams for six months without pay while the investigation unfolded. Williams was barred from speaking publicly, so his side of the story essentially hasn't been told. Meanwhile, Holt took over "Nightly News" and received widespread support from staffers at the network. "Lester has oil tanker-sized reserves of good will," one longtime NBC staffer said earlier this month. "Many people are rooting for him." Holt is on vacation this week -- his first extended period of time off since Williams was suspended in February. As for Williams, Esposito's team reportedly turned up a number of other misstatements and exaggerations. But the network hasn't said anything about it, so it remains unclear how serious the other instances were. One person close to Williams said the decision to bring him back, albeit in a new role, indicated that there's "no smoking gun in the investigation." Deliberations about Williams' future have consumed many weeks. Burke and new NBC News chairman Andy Lack sought a pathway to keep Williams at his network home -- and not lose him to a rival -- while keeping Holt in the "Nightly News" chair. The two men eventually succeeded, according to the sources who spoke on condition of anonymity for this story. The decision will come as a relief to the people who have been hoping for Williams to return. But some key staffers inside NBC News have doubts about Williams; they are concerned that he has tarnished the news division. In recent days Barnett has been ensconced in meetings with NBC executives at the network's 30 Rockefeller Center headquarters, preparing for Thursday's expected announcement. After CNNMoney reported on Wednesday evening that NBC had made the decision to bring Williams back, The New York Times described his expected new role on cable. Williams is a fit for MSNBC, the Times said, because "in the coming months, MSNBC is expected to introduce more hard news and reporting from NBC News journalists during daytime hours, which would be something of a break from its more opinion-based programming." Indeed, internal speculation about Williams' future had centered on MSNBC, which has suffered severe drops in the ratings. A move to MSNBC would be a homecoming of sorts for Williams, who anchored a signature 9 p.m. newscast on the cable channel back in the late 1990s, before ascending to "Nightly News." 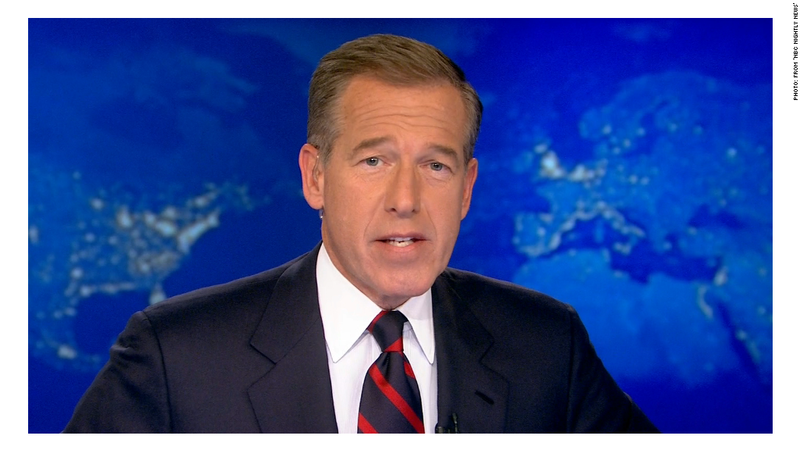 It was called "The News with Brian Williams."